So you have been to most of your more typical Eastern Caribbean islands, and for this year’s Caribbean getaway you are looking for something new and different. There are dozens of Caribbean islands south of the United States. So which one do you choose? I am happy to tell you that there are three best kept secret islands out there that most travelers know little about. The islands are Anguilla, St. Barthélemy (aka St. Barths), and Nevis. These islands off the beaten path all have that perfect white “din your toes” sand, coupled with that amazing azure blue water that is only seen in remote tropical locations. Take Anguilla for example. Anguilla has been well know by the rich and famous for years. Resorts are pricey. But now Anguilla is allowing more affordable resorts to land on their shores so that you, the experienced traveler, can check out this pearl of the Caribbean and not break the bank. For golfers, some of the most beautiful golf courses are scattered throughout this tiny island. The courses are stunning and surrounded by gorgeous Mediterranean themed villas. Courses are designed by Greg Norman and others and sit in natural mangrove thickets, saltwater ponds stocked with fish, and included sweeping views of the mountains of St. Maarten which is a stone’s throw from this island. (Water taxis between the islands are available). Anguilla feels exclusive to the first time visitor. It is almost like a secret place sealed away from the rest of the world. Food and Wine Magazine once called this little known island “the swank club in the Caribbean with no sign on the door.” If you are looking for high rise resorts, chain stores, or fast food, forget about it. The locals put these items on their so called “no list.” Anguilla is for wandering and exploring. Explore the intimate eateries most owned and operated by the locals. Take long walks along beautiful white sandy beaches where you feel like you are the first one there. So Anguilla is located just 45 minutes from St. Maarten’s Dutch side and 15 minutes from Marigot, on the French side. So many simply get discounted airfares from the USA to St. Maarten, and then hop a ferry to Blowing Rock, where the ferrys dock. The ferry ride over adds to the intrique and excitement of your first vacation to Anguilla. It makes it feel remote, tropical and special. 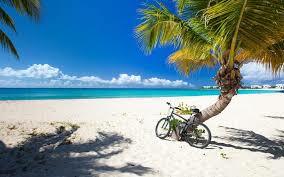 Anguilla has over 30 beaches to explore, some of them ranked among the world’s top ten. There is Maunday’s Bay, Shoal Bay — with its fine sugary beach sand, or check out the amazing coral reefs that serve divers and snorkelers alike. Boat building is Anguilla call to fame, as they build boats, yachts and other water craft for the rich and famous. Their hand work is well known throughout the world. But do not look for a close out sale on any vessel. Boat builders know that their end products posted for sale — will eventually get the high prices they want. Boat racing of course is Anguilla’s national sport and so its very easy to find sailing lessons and boat rentals for the day. For deep sea fisher enthusiasts, this is also a great jumping off point for deep sea fishing. For fun do not miss the out of the way bars and restaurants. One of the most famous is the Elvis Beach Bar that is housed in an actual racing sailboat that was shipwrecked on the Sandy Ground beach. For visitors and locals alike, these out of the way places offer exceptional places to unwind and relax, with tropical breezes and swaying palms. St. Barts is a tiny little island but do not let its 5 square miles of green and mountainous land disappoint you. It clearly is one of the most beautiful, Caribbean islands out there. And that is why its a favorite hang out for the rich and famous. The water is crystal blue and shimmering in the afternoon sun. Around Christmas time the island becomes alive as “the season” gets underway for two full weeks. At this time, it would not be uncommon to see movie, television and broadway celebrities eat, drink and be merry in the main harbor of Gustavia. Many of them own homes and yacts in St. Barts and this is their time to let their hair down, get away from the public, and relax. Gustavia is stunning and one of the most beautiful harbors in the Caribbean. St Barths (or Barts) are the shortened common names for the original island name of St. Barthélemy. Below is the beautiful harbor of Gustavia. If you enjoy great French food and wine coupled with amazing shopping, then this island is for you. At Christmas time prices are high and hotel accommodations are hard to get well in advance. However, go in the lower seasons, and you can grab some amazing rates and traverse the shops and restaurants minus the holiday crowds. You will find French high end brands in the shops. The other town on the island, St. Jean, sits steps away from some of the most amazing beaches in the world. It is really a treat to eat in St. Jean and then just cruise through the town. You can dine in some of the more “rustic” type (some might call them “earthy”) restaurants — with exceptional fresh fish and other food — plus you will find a nice mix of high end and and local shops. The island’s food is usually the star attraction. The Island was originally founded by the Dutch but then taken over by the French. The colonization was similar on St. Maarten but the French and Dutch somehow managed to split St. Maarten in two where French and Dutch sides still exist. On St. Barths any of the man bakeries on the island will serve up brioche, fabulous Sunday brunches, caviar, champagne and ceviche. Clearly you will also find some of the best fresh made buttered croissants outside of France. You Will Never Forget Nevis! Many of the 12,000 residents of tiny Nevis reside on old sugar plantations, still one of the main economic contributors to the island’s economy. Tourism brings in additional income to the island and in recent years, incoming tourist dollars are slated to equal or overtake sugar exports. Nevis is one of those mostly undeveloped of Caribbean islands, very much looking like many of the other Caribbean islands looked back in the 1950’s. There are a few scattered resorts, all situated on gorgeous beaches. And Nevis call to fame is the fact that it is a stone’s throw from St. Kitts via a 45 minute ferry ride from Basseterre, the capitol of St. Kitts. Cruise ships now port in St. Kitts and so its growth has been stunning. A good mix of high and low end shops dot the harbor area there and fine restaurants can be found in the downtown area. If you are in a hurry, the ferry ride is just 6 minutes from Reggae Beach. Here just two miles of water separate the two islands. If you are looking for relaxing, laid back and quiet, well Nevis has that with no question. If you rent a car and explore the island you will definitely encounter wild donkeys (no longer used for agriculture), monkeys, and wild turkeys. Charlestown is the capitol which offers the visitor a vision of what a Caribbean city looked like in the 1950’s. It is a step back in time. There are some shops and do not miss the birth place of Alexander Hamilton. Resorts include the Mount Nevis Hotel which was called Round Hill Plantation for many years. It has some very nice spacious suites and the best views of the island. The laid back pace is getting harder to find in the Caribbean, yet Nevis seems to hang on to it with relish. Change comes slow to the town and the island and the few resorts had to go through extensive approvals before construction final began. But if you do go do not miss the pig roast at the Hermitage, a tradition that goes back many years. You will also get fresh lobster fritters, johnny cakes, grille marlin and other island favorites. If you are looking for things to do, one of the favorites of visitors is to take a daytime cruise that will take you across the channel to some of the most excellent snorkeling areas in the Caribbean. On Sunshine Beach you will find a well known beach bar that is believed to serve the best rum cocktails in the Caribbean. Looking for more quiet and sedate getaways, try Nevis, St. Barts or Anguilla. It still retains the old Caribbean charm.